Enhance Your Bankruptcy Process With Notices A.I. Allow Notices A.I. 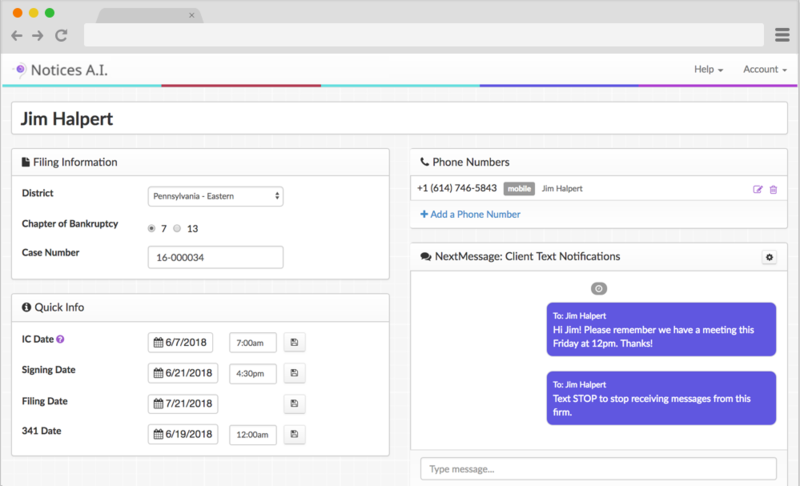 to save and organize court notices and use artificial intelligence to schedule hearings to your calendar. 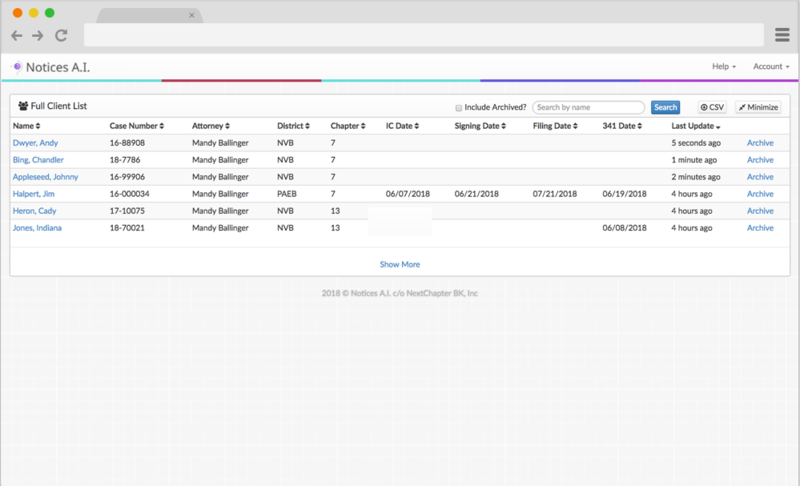 Dramatically reduce your quarterly PACER statements with Notices A.I. Notices A.I. uses artificial intelligence to direct court notices to the Notices A.I. Inbox. Court Notices are automatically saved from Pacer straight to the case file. New notices appear in the Notices A.I. Quick View on the firm dashboard for convenient viewing. Sort, filter and search all court notices from the Notices A.I. Inbox. Notices tagged as Hearing type will automatically be added to the firm calendar with our Hearing Scheduler feature. Filter notices based on proof of claim, hearings, and more! 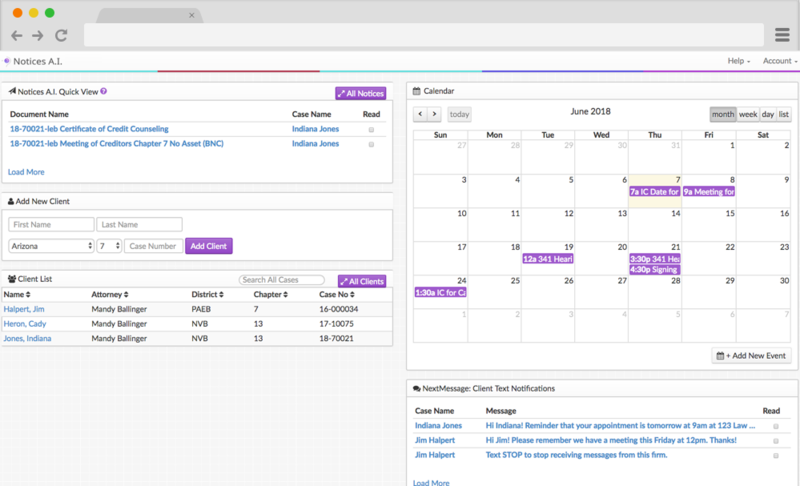 Never miss a court hearing date using our hearing scheduler function. Because we automatically save all notices, your firm won’t have to re-open files; saving you big time on PACER fees! New court notices will appear in the Quick View on the Firm Dashboard. Mark a notice as read once you’ve read it! Notices A.I. 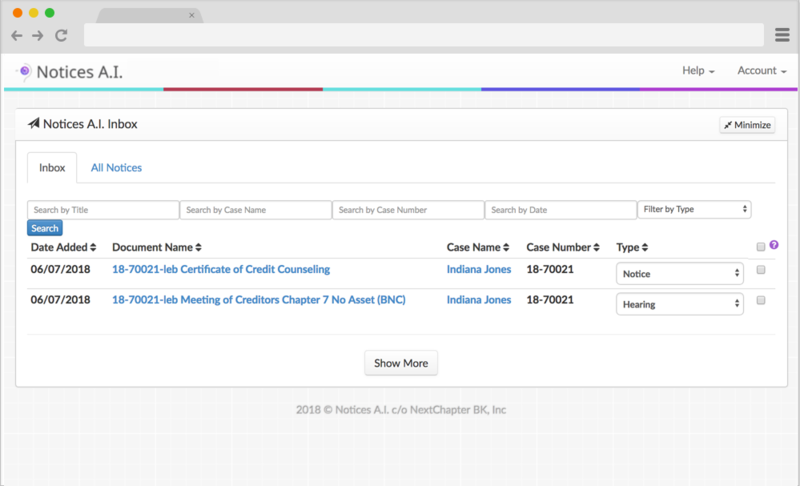 is available to every attorney and firm -NextChapter user or not! Store court documents in the Notices A.I. Inbox or download the forms to your computer. Sign Up for Notices A.I. Purchase Notices A.I. to complete your NextChapter subscription. Notices A.I. is complimentary for Pro and Whoa users. © 2018 Notices A.I. c/o NextChapter BK, Inc. All Rights Reserved.